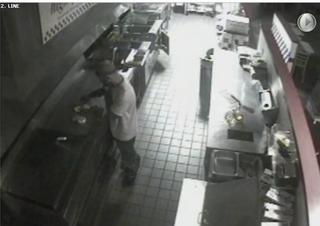 Washington, D.C., police are looking for a burglar (and cook) who was caught on camera making himself some food in a closed Five Guys fast-food restaurant, KHOU reports. The suspect is believed to have followed a delivery man into the establishment and then waited until the delivery man left before starting to cook up a storm, authorities say. The man, who was wearing a hat, pants and a white T-shirt, could be seen shuffling around the kitchen of the restaurant, tossing buns on the oven, although it is not immediately clear what kind of food he made on the restaurant's grills. In the video, the suspect appears to be nonchalantly chatting on his cellphone as he navigates the kitchen with casual ease. He also stole some bottled water before leaving the restaurant, which is located in the 1400 block of Irving Street in Northwest D.C., authorities say. According to the report, D.C. Crime Solvers is offering a reward of up to $1,000 for a tip that leads to an arrest.